Did Apple's alleged desire for stricter quality controls cause strike? Foxconn has moved to deny reports that an employee strike at one of its plants has halted production of the Apple iPhone 5. On Friday is was alleged that 3,000 to 4,000 workers left their posts at the Zhengzhou factory in central China, due to the imposition of stricter quality controls, reportedly requested by Apple. However, Foxconn has played down the reports and said only two minor disputes had taken place earlier in the week, which had resulted in no delays to the production schedule. In a statement emailed to Reuters, the company said: "Any reports that there has been an employee strike are inaccurate. There has been no workplace stoppage in that facility or any other Foxconn facility and production has continued on schedule." 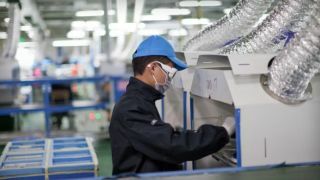 Foxconn added that the small scale disruptions on October 1-2 were "immediately addressed and measures taken, including providing additional staff for the lines in question." Apple's reported desire for stricter quality controls is said to be the result of widespread user complaints of out-of-the-box aesthetic flaws on the new iPhone 5 handset. China Labor Watch, an advocacy group based in New York, claimed on Friday: "This strike is a result of the fact that these workers just have too much pressure." Reuters also reports: "China's official Xinhua news agency quoted a government spokesman in Zhengzhou as saying some 100 quality inspectors at Foxconn refused to work for an hour on Friday after one was allegedly beaten by workers irate over the inspection demands." While the full picture of the reported industrial action is yet to emerge, it is clear that all is not well at the plant, which employs 130,000 people and assembles an estimated 70 per cent of iPhone 5 devices. Last month, there were also widespread reports of rioting at the Foxconn facility in Taiyuan in north China, which required 5,000 police offers to calm the situation. Both Apple and Foxconn have come under fire in recent years over the alleged poor working conditions for assembly workers.